Swing traders rely on a diverse arsenal of technical indicators when analyzing stocks, and there are literally hundreds of indicators to choose from. But how is a new trader supposed to know which indicators are most reliable? Deciding which technical indicators to use can frankly be a bit overwhelming, but it doesn’t have to be (nor should it be). While learning to master our winning system for swing trading stocks and ETFs in the early years, we tested a plethora of technical indicators. Our conclusion was that most of the technical indicators served their intended purpose of increasing the odds of a profitable stock trade. However, we quickly discovered that using too many indicators only led to analysis paralysis. As such, we now avoid this problem by simply focusing on the tried and true basics of technical trading: price, volume, and support/resistance levels. One of the easiest and most effective ways to find support and resistance levels is through the use of moving averages.� Moving averages play a very big role in our daily stock analysis, and we rely heavily on certain moving averages to locate low-risk entry and exit points for the stocks and ETFs we swing trade. For gauging price momentum in the very short-term (a period of several days), we have found the 5 and 10-day moving averages work very well. If, for example, a stock or ETF is trading above its 5-day MA, there is usually no good reason to sell. One possible exception is if the stock or ETF has made a 25-30% price advance within just a few days. The 10-day MA is a great moving average for helping us ride the trend with a bit more “wiggle room” than provided by the ultra short-term 5-day MA. 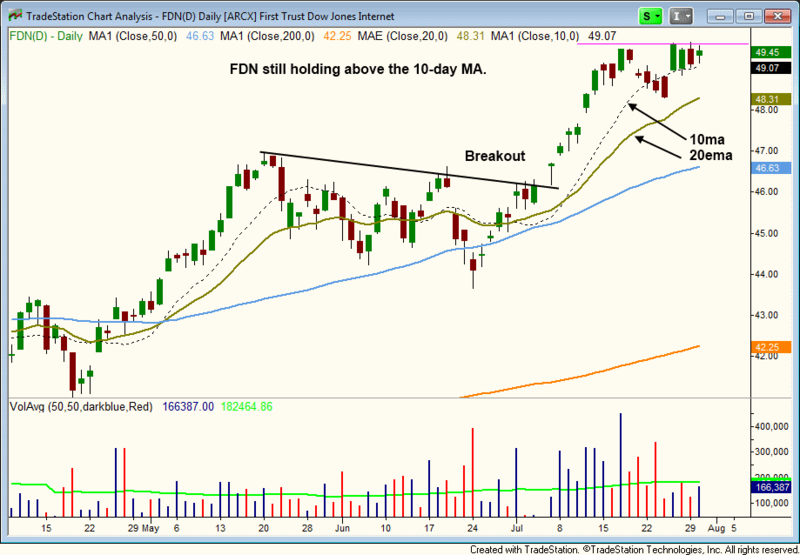 With the exception of a brief “shakeout” of just two days (a common and acceptable occurrence), notice that $FDN has been holding above its rising 10-day MA ever since breaking out in early July. This is a clear sign that the momentum from the breakout is still strong. 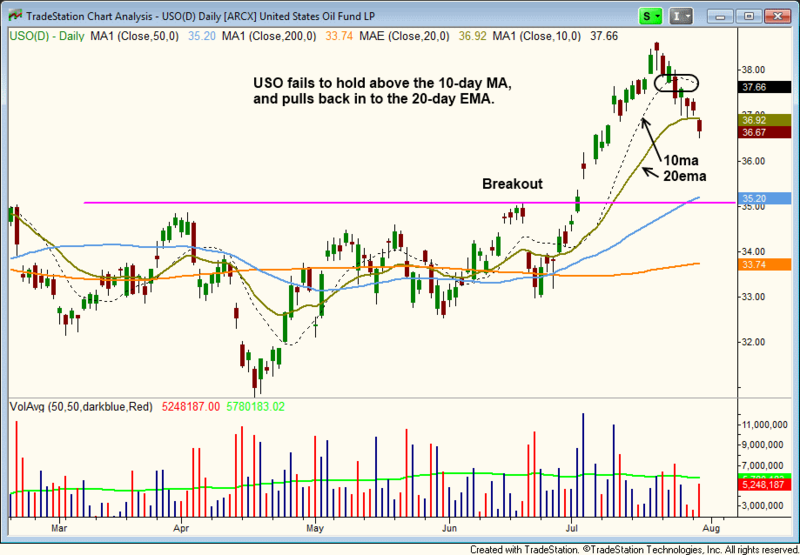 As you can see, $USO has failed to hold above its 10-day MA over the past week, which is a sign that bullish momentum from the recent breakout is fading. As such, we sold 25% of our existing position on July 25. It never hurts to lock in profits on partial share size when a breakout stock or ETF has broken below its 10-day moving average because such price action frequently leads to a deeper correction. Immediately after selling partial share size on the break of the 10-day MA, we were prepared to buy back those shares if� the price action immediately snapped back higher within one to two days (as $FDN did). However, since that did not occur, we canceled our buy stop and continue to hold $USO with reduced share size and a small unrealized gain since the breakout entry. While the 5 and 10-day moving averages are by no means a complete and perfect system for exiting a position, they allow us to stay with the trend in a winning trade (which helps us to maximize our trading profits). More importantly, using the 10-day moving average as a short-term indicator of support enables us to TRADE WHAT WE SEE, NOT WHAT WE THINK! To learn our complete and winning stock trading system, check out our top-ranked Swing Trading Success Video Course. We guarantee you won’t be disappointed! This is a good informative article, not just on oil but using technical analysis to your advantage. I like to use the 9 and 13 MAs. They move similar to MACD lines, and big moves occur before and after they cross each other. Thanks for your feedback. Always interesting for traders to share their favorite indicators. Hi Deron great strategies. Is that a Monte Cristo?Cuba will be a great investment strategy. Ha ha! Very observant, but it’s actually a Nicaraguan cigar named Perdomo. Cubans used to be excellent, but the quality has been downhill in recent years. I am trader, mainly day trading those days, because of the market instability. I have an online broker who provides quite an arsenal of indicators but no alert system. This makes my situation very comparable to that of a soldier in the battle-field, well armed nut with no communications. I developed my own trading strategy, which is rather simple. It uses the full stochastic and and three moving averages (2 WMA and 1 SMA). I also have a pool of about a dozen stocks. I however have no way to keep an eye on them to see which one has presented the opportunity to buy or short it, and I am often jumping from one stock to another, only to see the opportunities I have missed. I therefore would like to ask you if you can provide me with a scanner that, once my strategy (parameters of the moving averages and stochastic) is defined, I simply have to run it at any time of the day to fined if any stock has met the defined preliminary trading conditions. In the case you do, can I also try it for few days (a week or so) before becoming a member. Should it work for me, I do not mind paying for the trial period together with my membership. The Morpheus scanning service is NOT customizable in the way you mention, as it is hard coded to use our custom formulas to quickly and easily find the best stock charts. However, you may want to check out TC2000 at http://www.worden.com because it is very customizable and we use it all the time (no affiliation with the company).